struggle to see in your blind spot when driving your car due to neck stiffness? wake up each morning with a stiff neck or low back that goes away after 10-15 minutes? have low back pain when you pick up something off the ground or tie your shoes? get up from standing and have low back pain for 5 minutes, before it works itself out? experience excruciating pain in your neck or low back for 2-10 day periods a couple of times per year, always to have your pain go away completely after that period? If you answered YES to any of the questions above, then you have a bulging disc, or some other type of disc injury. Below is a video showing what an actual disc looks like, courtesy of ChiroUp. traumatic events (a 1 rep max deadlift gone wrong or a car accident). repetitive stress (sitting improper or excessive cycling). The inside of the disc looks like “jelly”. That’s the part that moves towards the outer edges of the disc or event exits the disc and pisses everything else off outside of the spine. Each progression in severity of a disc injury usually leaves people with more pain, less ability to do things in life now, and less expectation of being able to do things 1, 5, and 30 years down the road. At this time, there is no way to regenerate disc tissue and get your spine back. Therefore, it is vital to know how bad things can get so you can make smarter choices relating to how you will treat your back and neck moving forward. As the outer layers of the donut tear, the jelly starts seeping out. This is consistent with Internal Disc Derangement (IDD). IDD typically presents with 2-10 day episodes of pain and restricted range of motion. 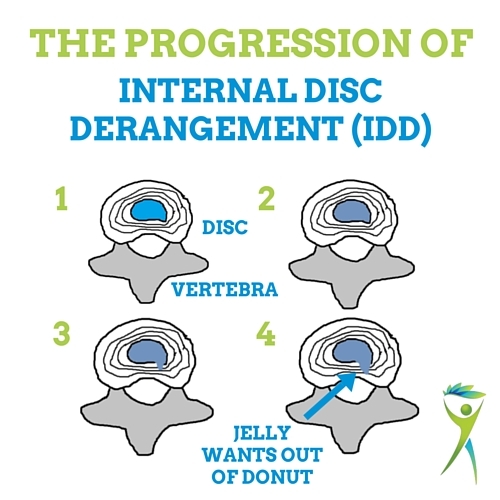 If you were to take out the disc of someone with IDD and look at it, the donut would be intact. There’d be no bulging, slipping, or visible jelly outside the donut. As the jelly pushes further and further, your typical diagnosis of bulging or slipped discs becomes more common. The pain in this situation would look just like IDD, but with increased severity and frequency of occurrences. If you were to look at the disc of someone with a bulge or slippage, part of the donut would be much larger. It could either look like a piece of a crumb in one spot or an entire quarter of the donut could be 25-50% larger. Up to this point, there has likely been no numbness, tingling, or weakness down the legs to the feet. In a herniation, you’d finally see the jelly coming out of the side of the donut. Because the jelly is now taking up space inside of the spinal column and may even be pushing on your spinal cord, you may start experiencing numbness, tingling, or weakness down the legs to the feet. If this is you, see a doctor immediately. With a sequestration, the jelly would be outside and separated from the rest of the donut. Similar to a herniated disc, you may have nerve symptoms with this level of damage. Weirdly, this type of disc problem tends to heal better than herniated discs. Are you one of those people who doesn’t believe in maintenance and never changes your car’s oil? If yes, how has that worked for you? Why do your car’s wheels need to be rotated? Do the break pads ever need to be replaced? How long do cars typically last? 100,000 miles? 200,000 miles? Or about 10-20 years if you take good care of it? You change your car’s oil to maintain the health of the engine. The engine wears, tears, and gets worse over time. We can all agree on why we need to get your car’s oil changed. Why Don’t Other People (Not You Because You’re Smart) Do the Same Things for Their Bodies? Similarly and very interestingly to your car, your bulging disc wears, tears, and gets worse over time too! Doesn’t it make sense to change your body’s “oil,” rotate your body’s “tires,” and replace your body’s “break pads” when time for a check-up? What about your muscles, bones, and discs? It’s not OK that people you and I know who are 50, 60, and 70 years of age are walking around like they’ve never had a tune-up before for their discs. Oh wait, it’s true. They’ve never had their body’s oil changed before! I won’t go into why chiropractic adjustments DON’T slow down your disc from getting worse. I’ve already written how chiropractic adjustments avoid the actual problem. 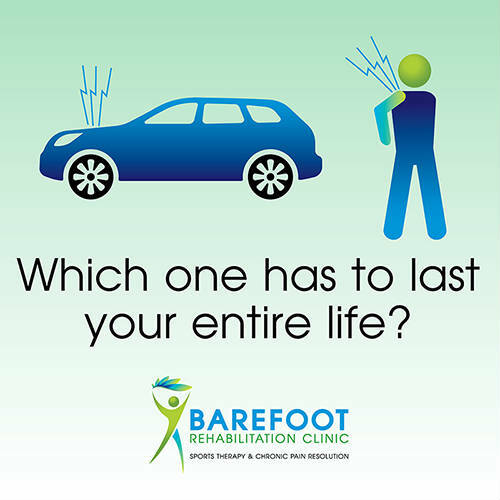 In our practice, Barefoot Rehab, I’ve found that most people take way better care of their cars than their bodies. Which is weird because you can buy a new car for $15,000. You can try to buy a new disc or body part with surgery or even get some stem cells, but now we’re talking 100s of thousands of dollars. Not to fail to mention that no human being has figured out how to create a nice, healthy disc as well as the one that your mommy and daddy gave you when you were born. So even if you do spend $100,000 on a new stem cell treatment, the probability of it working is closer to 0% than it is to 100%. Just like your car will wear and tear, degenerate, and get worse over time, your bulging disc is guaranteed to do the exact same thing. In fact, any bone, joint, or piece of cartilage that you’ve prematurely used up is guaranteed to get worse faster, as long as you’re still using it. pencil test – low back health. wrist extension test – forearm, wrist, and hand health. ankle dorsiflexion test – calf, ankle, and foot health. 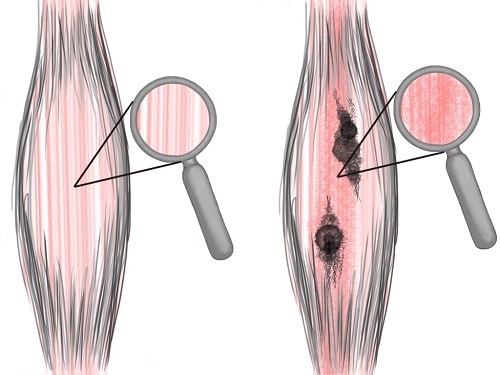 hamstring stretch test – hamstring and sciatic nerve health. other knee and hip tests. The following two steps are non-negotiable if you want to slow down your disc damage as much as possible. That means, if you want to have a disc that allows you to continue moving, walking, sitting, and standing 30 years from now, you have to set your body up age gracefully. Get all adhesion (the glue in your fascia) around the spine removed. 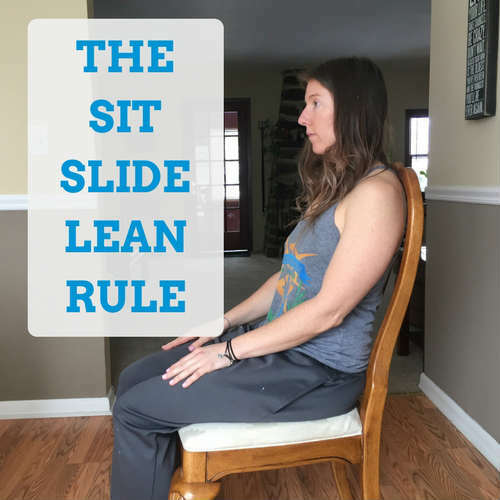 Use the Sit-Slide-Lean Rule any time you’re sitting in a chair. Adhesion is glue that makes your muscles tight and weak. The Sit-Slide-Lean Rule minimizes stresses on your discs when you sit. And since human beings in the 21st century now sit a lot, it’s really important to keep those stresses down. Dr. Chris and Dr. Curtis at Barefoot Rehab are Integrative Diagnosis professionals and have trained extensively in finding and fixing adhesion as fast and effectively as possible. Barefoot Rehab is the only clinic in North Jersey and Manhattan certified to find and fix adhesion. 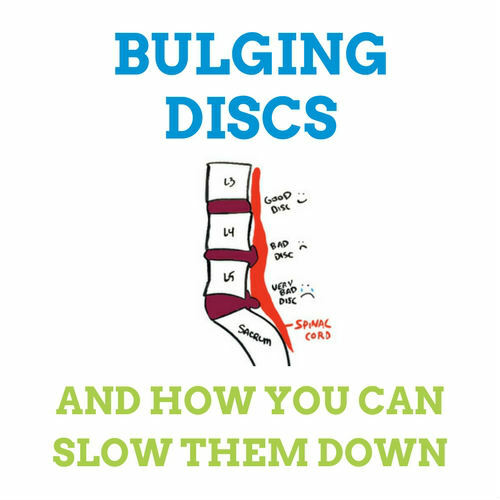 If you have had any of the symptoms outlined at the beginning, call us at 862-205-4847 (Parsippany office) or 929-251-3830 (Manhattan office) and find out how we can help slow down your bulging discs! Have you taken multiple images of your spine over the years? Are your bulging discs staying the same or getting worse? Following the steps above can make your MRIs look the same. That’s a good thing! Neither. Get adhesion removed. Yes, standing contributed. But so did lots of things like lack of exercise? Sitting excessively? Not eating an anti-inflammatory diet? etc.